Image: DC Comics. 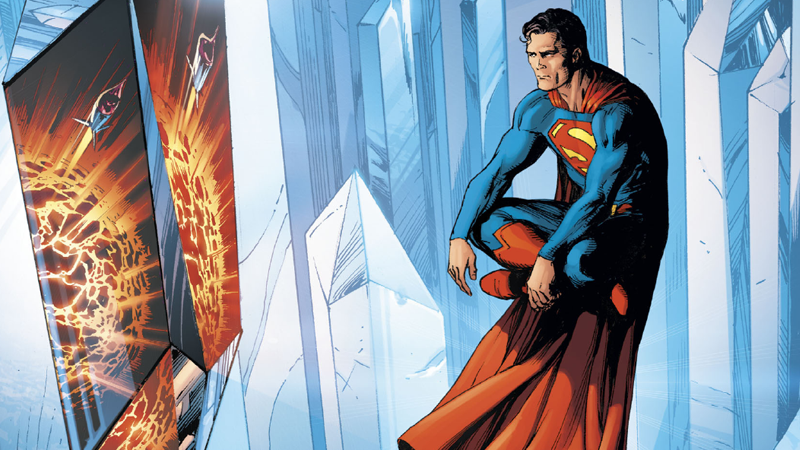 Action Comics #977 art by Gary Frank and Brad Anderson. The end of the Superman Reborn event has given us a major new evolution in Superman’s saga—a Man of Steel who is a singular mix of his pre- and post-New 52 versions of himself. It seems like the umpteenth time in recent memory that Kal-El has had his origin tweaked, but this time it’s a turn of events that could have some wide-reaching implications on DC’s current continuity. Today’s Action Comics #977—by Dan Jurgens, Ian Churchill, Hi-Fi, and Rob Leigh—has kicked off a two-part epilogue to the mind-and-reality-bending events of Superman Reborn. We get to see just what’s changed in Superman’s classic origins, as Clark, still hazy about what went down with Mxyzptlk’s machinations, returns to the Fortress of Solitude to re-learn his past. In a lot of ways, it remains a very familiar story. Krypton is still gone, the Kents still find Kal, and in the present day, Clark is still a Daily Planet reporter, married to Lois Lane and father to Jon. But all the little details that have been tweaked seem to imply one thing only: while this Superman is an explicit merging of his Post-Crisis on Infinite Earths self and his New 52 self, it’s really the Post-Crisis incarnation that’s coming out on top, re-establishing itself over the New 52. First, we get to go back and see Krypton before its destruction—a Krypton that, unlike the New 52 Superman’s origins, is depicted as a much more eclectic utopia. The New 52's Krypton borrowed a lot of elements from John Byrne’s own post-Crisis depiction of Superman’s homeworld, inhabited by an emotionally reserved people driven solely by their desire for scientific advancement. Before Flashpoint ever happened, much of that depiction was erased in Superman: Birthright in 2003, a Mark Waid/Leinil Francis Yu miniseries that brought back the idea of Krypton as a paradise on the brink of disaster, but the New 52 went back to Byrne’s vision... something that’s now been erased once more with a more Silver Age-inspired view of Kryptonian society. Additionally, when Kal-El arrives on Earth as a baby, the Martha and Jonathan Kent that find him appear to be in a much brighter place than their New 52 counterparts. In the New 52, Martha had recently been through a miscarriage before finding Kal-El, informing her decision to take the alien child in as her own, but the Kents we see here simply just never had a child before deciding to raise Kal. A picture of an older Jonathan with his baby grandson—glimpsed in Clark’s cubicle at the Planet early in the issue—also seems to hint that the tragic fate he and Martha suffered in the New 52 (a car accident that ultimately claimed both their lives) hasn’t occurred anymore. Beyond that, Clark had a pretty typical teenage life as he does in most versions of his origin story (although in another diversion from the New 52, it appears Clark’s powers didn’t manifest until he was in his teens—in the New 52, he has displays of his power at a much earlier age). He grows up with Lana Lang and Pete Ross as his best friends, and with Lex Luthor as his teenage rival. Even when we fast-forward to the present, a lot of what used to be canon before the New 52 is suddenly back again. Lois and Clark work together and are married, Daily Planet editor Perry White is Jon’s godfather. If anything, the only real acquiescence to the New 52 version of events included here is an offhand mention that Lois and Clark still live outside of Metropolis—presumably at the farm that the pre-Flashpoint Lois and Clark hid out on when they first came to the New 52 universe in the Superman: Lois and Clark miniseries, to avoid being caught by the then-alive New 52 Superman. Otherwise, the intention seems to be clear: while this is a merging of these two takes on the Man of Steel, it’s much of the original pre-Flashpoint reality that’s won out as “canon” rather than the New 52. As Action Comics #977 only brings us up to Clark’s arrival in Metropolis, there’s still a bit more of his early days as the Man of Steel we don’t know about yet. We’ve yet to see the full ramification of the two Supermen merging on the wider DC Universe, either. The seeming implication of all this is that the birth of the New 52 reboot back in 2011 didn’t erase the past of DC comics and replace it entirely with a new universe. It instead seemingly split these characters into two alternate existences: the existences fans had been reading for decades, and the shiny new one of the New 52. We’ve had other inklings of this, such as the return of Eobard Thawne as a Zoom who remembers his death in Flashpoint in the pages of The Flash #19. Superman’s own merging of his pre-and-post Flashpoint selves, and affecting his timeline, appears to have started some kind of chain reaction that is helping to merge these two “splits” into a whole again—a process which seems to favor restoring DC’s pre-New 52 continuity. So far it’s mainly on a character level, like with Clark, Zoom, and the re-emergence of the old Wally West. Could the actions of Superman lead to this “merging” for other major characters like Batman and Wonder Woman? At what point do we actually start seeing this on a universe-wide scale? All this tweaking and merging is building up to something big—something that, presumably, will culminate in the reveal of Watchmen’s Dr. Manhattan and the reasons behind his meddling with the reality of the DC universe as unveiled back in Rebirth. Even if we don’t know why just yet, at least we know that Superman’s got his history put back in place for now.